Neil fails to note that the automobile dramatically reduced pollution, eliminating the vast quantities of horse manure that were piling up in city streets at the turn of the 20th Century. At that time, an estimated 200,000 horses walked the streets of New York, producing 4,000,000 pounds of manure and 50,000 gallons of urine per day. It was not uncommon to see dead horses rotting in the street. In the summer time, dried manure turned to dust which choked the air. By 1908, an estimated 20,000 New Yorkers died each year from diseases spread by manure. Enter the internal combustion engine — and a literal breath of fresh air. The Model T and its reviled offspring not only reduced pollution, spurred economic growth, and sped urban transportation, they also improved safety. The fatal accident rate for horse-drawn vehicles in the early 20th Century was about seven times that of automobiles in the modern era. Even those of us who still love and keep horses cannot deny that the automobile revolutionized society, not only in America but around the world. It is no exaggeration to say that the invention of the automobile saved civilization, which was in danger of literally drowning in its own manure. The Model T was a big part of that revolution. Contrary to Neil’s aspersion, the Model T was not a “piece of junk” but a design admirably suited to its time. With its 20-hp engine and top speed of 40-45 mph, it did not need sophisticated instruments, and blackmithed body panels were quite practical in an age when blacksmiths vastly outnumbered auto mechanics. The Model T was not the first automobile, and in many ways it was not the best, but it represented a turning point. 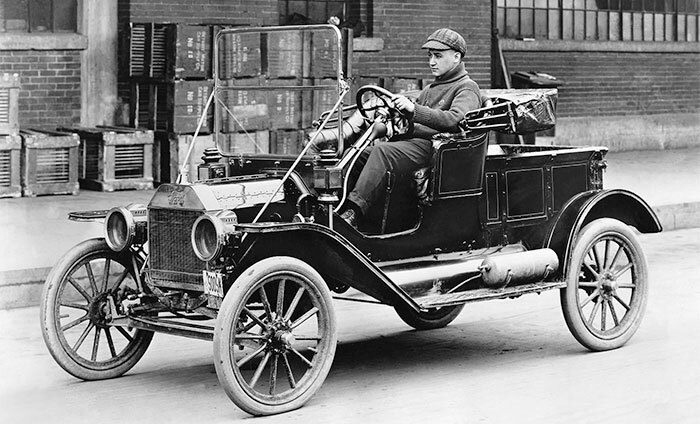 As many historians have noted, the Model T was the first automobile cheap enough that the workers who built it could afford to buy one. In that respect, the XCOR Lynx may represent the Ford Model T of space and the start of the Henry Ford era of spaceflight. XCOR has a company policy that every employee will fly on the vehicle. We haven’t heard whether Virgin Galactic has a similar policy for SpaceShip Two, but it wouldn’t surprise us. Consider how remarkable this policy is. 34,000 NASA employees worked on Project Apollo (along with 375,000 contractors). Fewer than 30 flew on Apollo. Even during the early, optimistic days of the Shuttle era, no one ever suggested that every NASA employee should be given a ride on the Space Shuttle. It would have been economically ridiculous to propose such a thing. Elon Musk is making enormous strides in helping to restore American access to the International Space Station, and Robert Bigelow’s inflatable modules may revolutionize space-station design. These are impressive accomplishments but, while Musk could afford a seat on the Dragon capsule and Bigelow might visit his own space station, most of their employees will remain grounded. The Lynx and SpaceShip Two will be the first spacecraft that the men and women who build it can afford to fly on, whether through their own savings or as a company perk. They will truly be the Model T’s of space. A century from now, one of Dan Neil’s intellectual successors may sneer at how suborbital vehicles conferred to Americans the notion of spaceflight as something akin to natural law, a right endowed by our Creator. The consequences, by then, will be “piling up,” from the air over our cities (cleaner, perhaps, due to safe, cheap solar energy from space) to the boots of our soldiers, whose rocket transports can place them anywhere in the world within 90 minutes. Dan Neil is probably an elitist prick. He doesn’t want to get rid of the car, only 99% of them. Inside Dan Neil’s head: You commoners have no right to own your own car. Public transportation for you. In fact, it’s too good for you teabaggers, but we of the enlightened class will grace you with a city bus and Amtrac. The automobile is only for upper crust, namely *me*. Interesting thought; I didn’t know that about XCOR, though I knew Jeff was losing weight to better fit into his own vehicle for his ride. What a great example they’ll set!! Does anyone still read Time? And you’re surprised by the Luddites in there? Really? I almost want to call you a pesimist. 2065 and they’ll be bemoning the complaint you outlined, and perhaps before. It will be faster this time – no WWI to interfear and kill off so many capable young men.